The Camp DeWolfe Adventure Challenge Course is located on 19 acres of woods and sports fields, and is set up to host your group’s adventure challenge retreat. The Adventure Challenge program consists of a series of challenges and problem-solving activities created to involve a group physically, mentally and emotionally. Camp DeWolfe’s facilities offer full day or half day workshops to schools, churches, non-profits or businesses to groups of up to 25. Sessions are for 12 participants per facilitator. Educational and Recreational Workshops are both offered. The Adventure Challenge program includes elements of both personal challenge and team building group work. The Low Ropes course activities focus on team work, communication and spotting techniques for group development. The High Ropes Course focuses on the individual’s performance of challenges above from the ground,using a belay safety system. 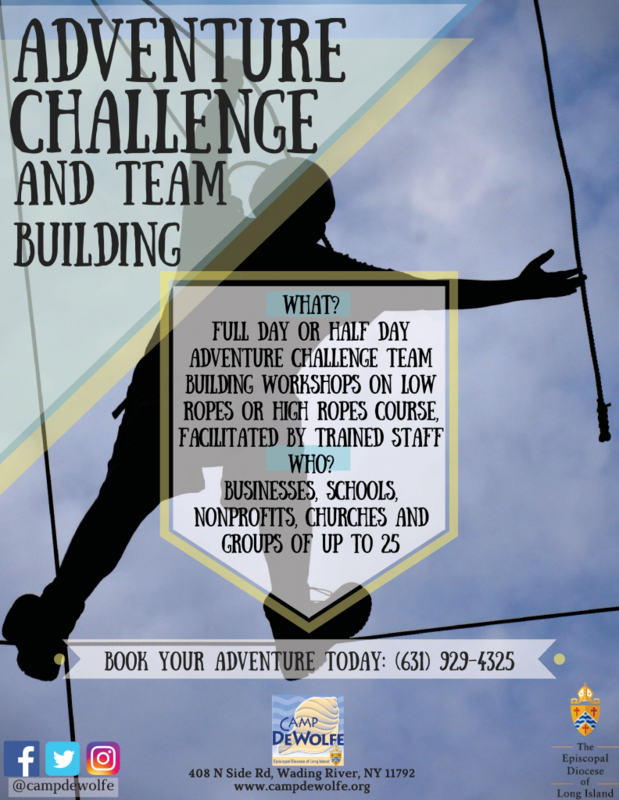 Contact the Camp DeWolfe Office today on (631) 929 4325 to book your Adventure Challenge Workshop or Retreat.